Co-creation emphasizes the generation and ongoing realization of mutual organization-customer value. Historically, organizations spent too much time and effort to extract as much value out of a relationship as possible. Unfortunately, customers are now more knowledgeable, connected and interactive than they have ever been. This was one of the themes in my Evolution of the Contact Center post last month, I subtitled this ‘Governance’. In trying to play catch-up on my reading, the June issue of Harvard Business Review took a similar stance. 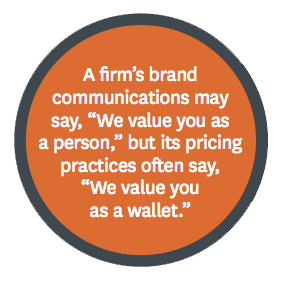 They called it “Pricing to Create Shared Value” (by Marco Bertini and John T. Gourville). While my focus was (and still is) customer service, the HBR article in the June 2012 issue focuses much more on pricing strategies. There are some great examples, ones many of us have heard before. The airlines (yes, the poster child for doing things wrong). Do everything they can to extract value. Once you have confirmed your seat, everything else is a cost; from baggage to pillows. In this instance, the overall customer experience is abysmal and the traveler is left with a sour taste in their mouth. Before I read this article, I had not considered this point. According to the authors “value neither originates with nor belongs solely to the firm. Without a willing customer, there is no value.” Fascinating in the simplicity of the statement. When I was first reading the article, I was about ready to challenge the premise, until the last phrase. Without a customer, there is no value – simple really. The authors extend the premise by simply using logic. If you cannot have value without a customer, value must be shared. Value can be enhanced (expanded) via co-creation. It is true that there is a little bit of chicken and egg going on here, as the company must initiate the process of creating something valuable, but it is positive feedback loop if done right. Money or currency always seem to be an afterthought in these conversations. Academics talk about value exchange, when they really just do not like say the word ‘money’. Why is it that pricing decisions undermine the the relationship? Because, the firm tries to extract as much value from the individual as possible (to make the numbers). However, if the firm is transparent about how it makes money – yes, businesses are there to make money – the transparency builds trust and loyalty. Within the article, there is an a great example, especially for those who have heard the phrase ” You do not actually want a drill, what you want is a hole in the wall”. Hilti is a company who created a Fleet Management program, operating on just this premise. The realization was that construction company’s do not really care about owning tools, what they wanted is the outcome of using the tools (aka a hole in the wall or a hole in the ground). There is a whole lot more to the article, I only hit the tip of the iceberg, well worth the read. I should have known better than to specify exactly what I would cover in part 2 (Here is Part 1) – but in my own defense, I did mention something about this being a journey. I do promise to circle back to the role of sales really soon – to be very direct, the exact role of the sales person, in a model where we are working to create buyers, not sell (see, I told you) is going to take some more thought. Interspersed between client visits, business dinners and a visit with my Mom, good friends seemed to have found some very interesting articles which really helped to solidify my thoughts in a few areas. Of course, thrown into the mix is Michael Krigsman’s interview with Paul Greenberg (an excellent, must read/listen). Finally, a great dinner conversation with Josh Weinberger in NYC in which topics on CRM from 1999 through 2010 all seemed fair game. Other than filling you in a bit on my comings and goings, what exactly is my point? Your peers, social networks and your CUSTOMERS are always talking. Information, valuable tidbits will appear at any time. While it is nearly impossible to listen to everything, all the time, you should be prepared to act on information when it becomes available. So, as I continue down this path, remember that one of the most difficult tasks is figuring out exactly what your customers want – listen as much as possible. The objective is not only listen to what they say they want, but what they determine to be valuable. This is a subtle difference. All Businesses must be in touch with their market, their customers and it is still about product after all. If the value (not yours, the value perceived by the customer) is not there game over. You can have the most finely tuned Social Business in the world, but it will not make up for bad product. While the world has changed a lot – somethings have not – customers do want value. To answer the … question, you need to construct a customer value proposition (CVP) — not by trying to convince customers of the value of your products but the other way around, by identifying an important job a customer needs to get done and then proposing an offering that fulfills that job better than any alternative the customer can turn to. I wanted to dig a little deeper, so I went to the 2008 article referenced by Johnson. The most important attribute of a customer value proposition is its precision: how perfectly it nails the customer job to be done—and nothing else. But such precision is often the most difficult thing to achieve. Companies trying to create the new often neglect to focus on one job; they dilute their efforts by attempting to do lots of things. In doing lots of things, they do nothing really well. There are two very important points made here, and if you are listening (not to me to your customers) then you will be able to meet the challenge – understand what your customers really want, so you can provide it. For one, stop selling and focus your efforts to create buyers. Do not try to put everything into one product and satisfy everyone at the same time. It is not the company value proposition, nor the product value proposition, it is the customer value proposition. Michael listed a few “Practical Steps” you can use in working to engage your customers (blog reference above). Listen to your customers’ voice directly from their actual larynx, rather than to the opinions rolling around in your head. For example, build a customer advisory committee and ask exactly what they want and think. Participate in their communities to find out who they are, what they want, and learn how they can also provide value to you. A company can engage this way with only one or two smart people. It’s not heavy lifting. So, there is something new. While it might have been said before, or talked about, somehow it seems new. We have heard that we need to Listen. Then we were told we needed to Engage, one way broadcasting became two way communications. Participation – that is interesting. Is there a difference between Engaging and Participating? Something to think about.